Although it may not seem like it, your child spends around 25,000 hours sleeping from birth to seven years, so the Stokke press release says. As parents we know that this is as essential for our own well-being as it is for our babies. I had personally been through three cots before I bought a Stokke® Sleepi for FunnyGirl and I have always thought it to be a tad decadent saving the most expensive option till last but hey ho! 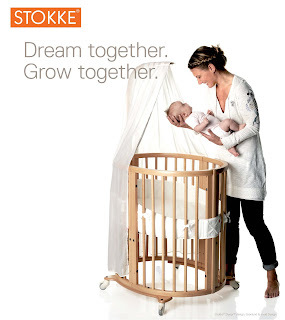 I loved my Stokke Sleepi - OK so it wasn't really mine but I loved everything about it. The soft curves, FunnyGirls love of sleeping and also the fact that she didn't do that round in circles thing that all of my other children had done. You know where you put them to sleep one and and they wake up at the other! Stokke® have now collaborated with Natural Mat, the leading manufacturers of organic cot mattresses to create a version of their beautiful natural organic Coco Mat mattress especially for Sleepi®. Handmade in Devon, the Natural Mat Coco mattress is breathable, self-ventilating, hypoallergenic and offers natural protection from dust mites. Makes me all broody! I just wish that I had a baby to put into mine! I should also add that the life span of Stokke® Sleepi goes above and beyond the cll of duty. It begins life as an oval mini-cot, perfect for new babies who need a cosy nest. As baby grows so does your Sleepi™ easily transforming into cot. When your monkey starts to climb to climb, you can lower the base and remove a side for independent access. When space is getting tight buy the Junior Bed Kit so that your little one doesn't have to move on. FunnyGirl has recently moved into her big girl bed but she loves her Sleepi. It still takes pride of place in her bedroom as her sofa and she is usually to be found, snuggles up there watching TV! Stokke® Sleepi™ Mini Coco Mat Mattress £85, Stokke® Sleepi™ Coco mat Mattress £199. Available from Natural Mat, Lullabys and Back in Action. It is so cute! I love this! One important factor to achieve a goodnight sleep is a good mattress and pillow. We are all very hardworking individual, we deserve a good sleep. content you provide about mattress really helps me..